In the United States, public talk about charity for the poor is highly moralistic, even in our era of welfare reform. But how do we understand the actual experience of caring for the poor? This study looks at the front lines of volunteer involvement with the poor and homeless to assess what volunteer work means for those who do it. Rebecca Allahyari profiles volunteers at two charities—Loaves & Fishes and The Salvation Army—to show how they think about themselves and their work, providing new ways for discussing charity and morality. 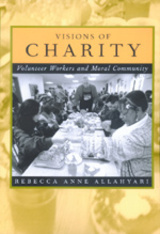 Allahyari explores these agencies' differing ideological orientations and the raced, classed, and gendered contexts they provide volunteers for doing charitable work. Drawing on participant observation, intensive interviewing, and content analysis of organizational publications, she looks in particular at the process of self-improvement for these volunteers. The competing visions of charity Allahyari finds at these two organizations reveal the complicated and contradictory politics of caring for the poor in the United States today. Rebecca Anne Allahyari is Research Associate at the School for Advanced Research in Santa Fe, New Mexico.